N ° 1 Quercetin PLUS is a unique composition of three high-quality ingredients with increased absorption. Quercetin is an organic compound of plant origin from the group of polyphenols. Due to its structure, it is considered as an "ideal" example, showing how spatial structure affects biological properties. Turmeric root extract CURSOL™ is a double-patented active ingredient guaranteeing the highest absorption rates of all extracts. Turmeric has a strong anti-inflammatory effect. Low quantity but high absorption is a key element of its quality. CURSOL™ is especially intended for all ailments involving inflammatory processes. It is a natural anti-inflammatory with a high level of safety and activity. Black pepper extract standardized to a min. 95% piperine. Helps digestion and absorption of nutrients. Helps in maintaining the integrity of the body through anti-parasitic antibacterial action and support for the immune system. Cursol™ is a double-patented active ingredient guaranteeing the highest absorption rates of all extracts with a strong anti-inflammatory effect. Cursol™ is particularly recommended in conditions involving inflammatory processes. In the form of a loose powder that we have enclosed in a capsule which enables the combination of other extremely valuable ingredients, these are quercetin and piperine. The combination of quercetin and piperine maximized the benefits of supplementation. Cursol™ is a 100% natural ingredient, so its use does not cause side effects. It is characterized by its high level of safety and activity. The preparation has been tested for oral toxicity. This test was carried out at PHYCHER Laboratories (France). 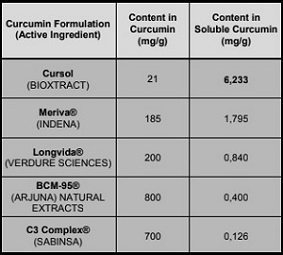 Comparison of the absorption of turmeric with other extracts available on the market. 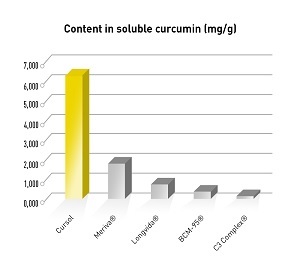 Of all the raw materials available on the world market, containing turmeric, Cursol™ has decisively been found to be No. 1. Ingredients: Quercetin, Curcuma longa L. extract CURSOL™, bulking agent: microcrystalline cellulose; anti-caking agents: magnesium salts of fatty acids, silicon dioxide; Black Pepper Extract 95% Piperine; glazing agent: hydroxypropylmethylcellulose; dye: titanium dioxide; gelling agents: carrageenan, potassium acetate. 1. Who is the N°1 Quercetin PLUS nutritional supplement intended for? The main ingredients contained in the N°1 Quercetin PLUS product are ingredients that have anti-inflammatory activity, that is why the preparation is especially recommended for people who want to reduce inflammation or increase levels of ESR and CRP. In addition, thanks to the content of the patented ingredient Cursol, the preparation is an ideal pain relieving stimulant. 2. What is the composition of the N°1 Quercetin PLUS dietary supplement? Nutritive supplement N°1 Quercetin PLUS is a unique composition of three of the highest quality ingredients which have increased absorption. The components of the N°1 Quercetin PLUS nutritional supplement are Quercetin, CURSOL™ Turmeric root extract, microcrystalline cellulose, magnesium salts of fatty acids, silicon dioxide; Black pepper extract 95% Piperine, cellulose capsule. 3. Will I find gelatin in N°1 Quercetin PLUS? No. We do not use commonly used gelatine capsules in any of our products. We only use vegan capsules made of vegetable cellulose. 4. Can N°1 Quercetin PLUS be used by vegans? Yes. The preparation contains only natural plant extracts, therefore the product can be used by vegans and vegetarians. 5. How should I use the N°1 Quercetin PLUS dietary supplement? Dietary supplement N°1 Quercetin PLUS should be taken in the amount of 3 capsules a day, preferably in the morning, wash down with water. Do not exceed the recommended dose for consumption during the day. Dietary supplements cannot be used as a substitute (replacement) for a varied diet. A balanced diet and a healthy lifestyle are important for maintaining good health. Consuming the recommended daily portion of the product provides a beneficial effect on health. 6. How should the N°1 Quercetin PLUS dietary supplement be stored? Dietary supplement N°1 Quercetin PLUS should be stored at room temperature, in a dry place, in a way unavailable to children. 7. How many capsules are in one pack of N°1 Quercetin PLUS dietary supplement? 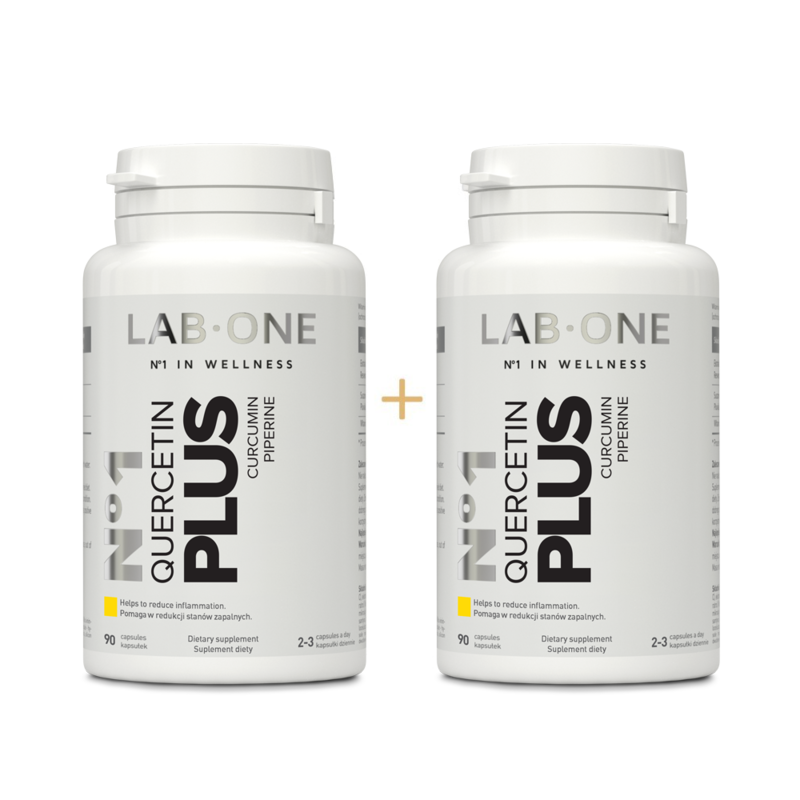 One pack of N°1 Quercetin PLUS dietary supplement contains 90 capsules that are sufficient for a month of use. The net weight of the product is 54.09 g.
8. Can I combine different Lab One products? Yes. Lab One dietary supplements can be combined with each other. The active ingredients contained in the products do not eliminate each other's actions, they can even act as an auxiliary in various aspects of the proper function of the body, and due to their combination, they provide a comprehensive effect.